At last – a quick, easy, affordable way to get organized. With our super-strong, super-versatile Grids,you’ll never misplace a tool again. Maximize both wall or overhead storage, the choice is yours. Each GarageGrid is made of welded, heavy-duty steel. Grids mount vertically, horizontally or from the ceiling. Includes wall mounting clips & spacers (6 per Grid). 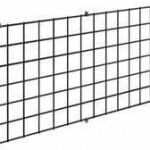 For accessories, use Activity Organizers, HandiWall accessories, StoreWall accessories, Wire shelves and baskets, most any of the slat wall accessories, items noted as “grid friendly”, or grid hooks shown in grid accessories category. SKU: G-GG24v. Categories: Grids & Grid Accessories, Slat Grid & Accessories.